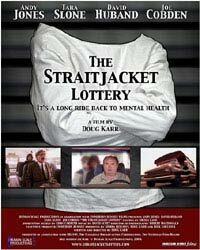 The Straitjacket Lottery is an award-winning comedic short. The story revolves around Boris Durban, a character played by Andy Jones. On an otherwise normal day he loses a small busload of mental health patients, five to be exact, when a patient with intense claustrophobia manages to overcome her illness by leading the way for the other patients to escape. Boris who has to have the patients at a maximum security facility by eleven o’clock is confronted with an empty bus. While he tries his best to recover the patients, all his attempts are foiled. That’s when Boris decides to fill his quota by enticing some unsuspecting civilians onto the bus.It may be a short, but The Straitjacket Lottery provides a wide-angled view into the erratic world of mental health and the thin line between idiosyncrasy and insanity. The movie premiered at the 2004 Niagara Independent Film Festival where it won Best Comedy. It was also nominated for Best Comedy and Best Male Performance for Andy Jones at the 2004 Canada Golden Sheaf Awards.